What is the deal with the Sony Rocket Project? Months ago I saw the ad on YouTube for the Sony Rocket Project and got really excited at the possibility of high school students launching an actual rocket into space. 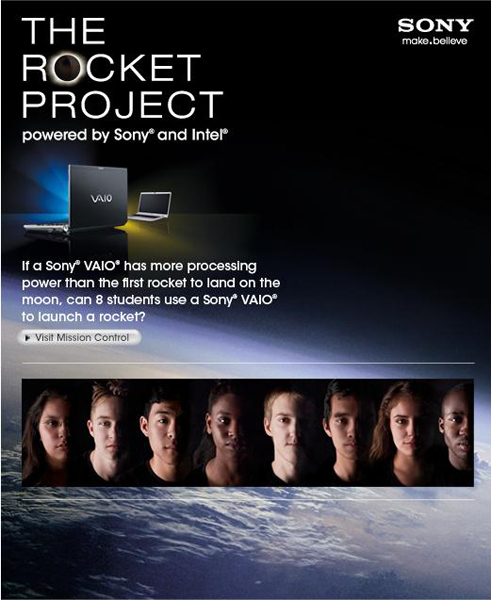 Sure, I could see through the PR campaign by Sony and Intel to prove that their new laptop had the computing power necessary to build and launch a rocket, but high school students putting rockets into space, what's not to like? So my students and I followed all the blogs and videos anxiously awaiting the day of the launch. There was a delay due to weather, but I could be patient. But then days turned into weeks and still nothing. There were weeks without any news, just the post that said that the delay was due to weather. I followed the so-called jet stream trouble and I knew the day that it was no longer over their launch site and still nothing. From what I can understand from the few cryptic posts on the website -- the team has lost the window of opportunity for launch. Well Sony and Intel, good luck digging your way out of this one. It was to be their big launch of the super computer built especially for students and schools. However, they have just learned the biggest lesson when it comes to using school technology -- nothing goes like you plan. So my heart goes out to you. I, like many of you, have been there. So buck up and get that rocket into space. LIGHT THAT FUSE AND LAUNCH THAT BABY! Just Who Is the Teacher Here?